Congratulations Cindy! You are definitely a superhero! Tribewe all need an incredible tribe!We are the average of the five people we spend the most time with. Since Cindy Minear’s first day at Mo-Mentum she has been “ALL IN.” Cindy has been ALL IN to her aspirations, to her family and friends and to Mo-Tribe. Cindy LIVES EXTRAORDINARILY! Living extraordinarily doesn’t mean you live every moment happy and problem free. Instead, living extraordinarily means looking at problems as obstacles that train us to be better. It means leaning in when days get rough instead of looking for excuses to quit. It means following your heart and living according to your values. 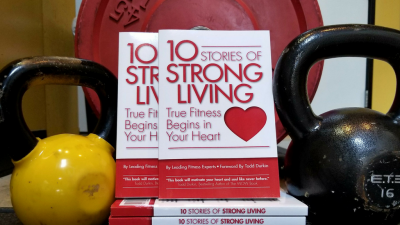 Living extraordinarily means living vibrantly because you’ve taken great care of your body, mind and spirit. It also means that none of us do this “living thing” perfectly and when we do stumble we get up, dust ourselves off, learn from the experience and move on. Whenever I talk to Cindy she has something interesting going on in her life. She’s starting a new business, one of her 6 children has an event she’s helping with or she’s planning for a vacation or a interesting family event. Cindy is always busy, but she’s never too busy to take care of her body, mind and spirit. Cindy understands that if she doesn’t take time to put on her oxygen mask, her family will pay the price. Cindy lives by her values. She hasn’t told me her values; she doesn’t have to tell me because they stand out in her consistent actions. I know Cindy values her family; they come first. She values her health and understands that living extraordinarily means taking care of her body. She values her friends and she values a growth mindset. Cindy doesn’t ever seem to be stagnant or bored to me! She’s too interested in life for boredom. AND one of my favorite things (and I have several favorite things) about Cindy are her bright, cheerful leggings, a definite sign of her individuality and affinity for fun! 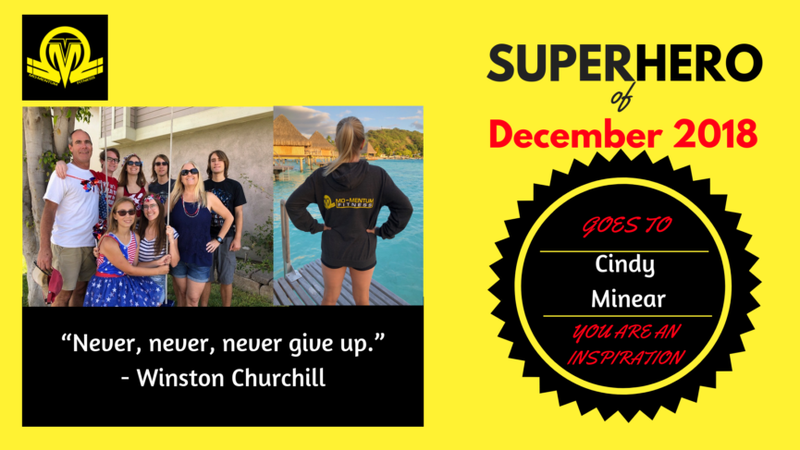 We chose Cindy as the December super hero of the month because she LIVES EXTRAORDINARILY! This is our “tag line” because life is too short to live unfulfilled, angry and in fear. We help our Mo-Tribe live life ALL OUT and with no regrets! If you need inspiration, watch Cindy Minear! She is a Wonder Woman, Amazon Warrior! We love you Cindy! Meet Desiree, Mo-Mentum Fitness’s Superhero of November! She definitely is a superhero! Let’s focus in on the blood work. What kind of changes have you seen there? What do these changes mean for you lifestyle, longevity, finances, etc.? These days, what makes you truly happy and feel at peace? I’m 55 and have been married to Dan for 25 years. Together we have six children: Talia (23), Kayli (21), Aidan (18), Jared (16), Riley (16), and Falyn (12). I spent 13 years as a software engineer working for Boeing on the International Space Station project before “retiring” when I was pregnant with the twins. Since then I’ve kept myself busy raising kids and starting businesses. I started Scrappin’ Twins when my twins were small, which is a business dedicated to providing products for twin and triplet families. My newest business is aududu book creator, a website that provides tools to help authors create low content books like journals, logs, planners, and notebooks.